Before we start, special thanks to TFWiki.net for being a great checklist on all of Prime’s many appearances. The above is the very first appearance of Optimus Primes, as seen in the comic published by Marvel: Transformers #1. To this day I do not know of a single time he has had a toy in this vehicle mode, althro there have versions of him before he was the Autobot name, when he was called Orion Pax. Being a fan of everything Transformers back in the day, I collected all of the Marvel Comics US version of the comics, but they were not as good as the cartoon. However, after the first three years they were pretty much all the story American fans had. This is the default look of Optimus Prime in the cartoon. When we returned to life in the last episode of season 3, he was soon covered in all white…a look that did not last as he went back to his normal colors during the three episodes of the fourth season of the G1 cartoon in America. Here is what the original toy looked like. If you read the file card for Optimus you’d gather that his other two components were also important and that each compartment could feel the pain of the others. However, aside from Roller appearing the the original trilogy of the first season, the other compartments would only be featured once (in a season 2 episode) and they were never seen in the comic. The original toy was a bit fragile, but not as badly as some of the others. G1 had the better cartoon, but later decades had better toy versions of Optimus and the rest. 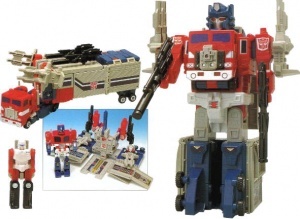 There would be many color variants of this mold for Opitmus, especially in Japan where he is known as Convoy. Here is Optimus as he appeared as Orion Pax when the Aerialbots were sent back in time during the second season episode War Dawn. Needless to say…he beefed up. When he finally came back as a toy, he had the Powermaster gimmick where a separate figure transformed into an engine, and you had to put the engine in the slot (or push the right button) so that Optimus could transform from truck to robot. His trailer could also join with him to create a super Optimus figure that had great height, but little poseability. He appeared in the last year of G1 in America as an Action Master. Action Masters featured Transformers which couldn’t transform, but had accessories that could. To be fair, Action Masters had more poseability that most of the 61 line, but that wasn’t saying much. The Action Masters weren’t that bad, but their vehicles just looked cheap as heck. After a couple years of hiatus for Transformers in the United States, there came Generation Two, which where the the term “G1” began. I collected few of the Transformers back then as most of them were reissues with higher price tags and uglier colors. I really only remember the Optimus toys being at Kay Bees, which I rarely ever bought things from as they were super expensive on everything, which told me their exclusives were as well. The one Optimus figure I purchased back then was this one, which is basically a transforming Matchbox/Hot Wheels car. It wasn’t a bad toy, but it does not scream Optimus. Eventually there came Beast Wars. Later on it was established that Optimus Primal was a different character than Optimus Prime, but the initial two toys did no state that, nor did the comic that came with the first figure, where Optimus Prime transformers into…a bat. One could understand that they had to keep the animal relatively small to be part of a 2 pack where Megatron came back as an alligator, but a bat? Surely there were better things far more awesome for Optimus to come back as: a lion, an ape, or the greatest of all, a penguin. Later Optimus Primal figures were way better, of somewhat cheesy. The figure that came out later that same year turned into a giant ape that had great poseability and many cool features. The next year had Optimus as a cybernetic ape that had a surfboard that let him fly (WTF). Later there was a giant orange Optimal Optimus that was so bad it’s good. The less said about the eventual Beast Machines the better, althro in the Japanese Beast Wars Neo they had Primal transform into a Mammoth, which was the second best transformation of the series (the best being of course Break, which transformers into a penguin). This entry was posted in Transformers.